With a smooth countdown behind her, Atlantis launched on her opening opportunity on the STS-129/ULF-3 mission to the International Space Station (ISS). Engineers only had to work one issue during the count – relating to noise on the H2 pump inside Fuel Cell 2. Over one month after arriving at Launch Pad 39-A, orbiter Atlantis is ready to embark on her 31st voyage to space. The mission – STS-129 – will be the 129th shuttle flight and the 31st shuttle mission dedicated to construction and outfitting of the International Space Station. Coming at the end of a highly successful year for NASA, Atlantis entered S0007 operations (launch countdown) at 1300 hours on Friday, November 13. Since then, she has enjoyed an issue-free countdown, with launch personnel completing the Power Reactant Storage Distribution (PRSD) system load for the orbiter’s Fuel Cells on Saturday evening. When PRSD load was complete, there were 2 days of LH2 (Liquid Hydrogen) pad hold time and 5 days of LO2 (Liquid Oxygen) pad hold time available. While these numbers differ from the pre-load estimates, these pad hold time numbers will support all STS-129 countdown objectives, including the ability to try for three launch attempts in a row if needed. If not, the plan is to accomplish a single commodity top off of LH2 during a standard 48-hour scrub turnaround. LO2 replenish is not necessary as the LO2 pad hold time exceeds the available window for STS-129. Further, workers at Pad-A removed the Rotating Service Structure from Atlantis and the 129 stack at 5:30p.m. Sunday evening before beginning final vehicle power-ups and check-outs for flight. The pre-launch Mission Management Team met at 4:30a.m. to review the status of the 129 vehicle’s system before giving a “go” to proceed with cryogenic loading of the External Tank with over 500,000 gallons of LO2 and LH2. Liquid Hydrogen began flowing into Atlantis’ External Tank at ~5:13a.m. – ten minutes after LH2 chilldown operations commenced. Likewise, LO2 loading of the External Tank began shortly befor 5:43a.m. Liquid Oxygen loading entered “fast fill” at around 5:53a.m. with LH2 loading entering “fast fill” mode at ~6:03a.m. LH2 topping followed at 7:18a.m. with both LO2 and LH2 entering stable replenish at ~8:03a.m. The Flight Crew left the Operations and Checkout building and have ingressed the orbiter – around which time an issue with Fuel Cell 2 was reported, relating to noise on the H2 pump. 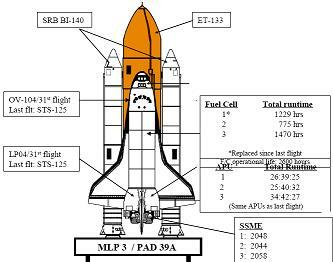 This has been seen before with STS-125, and a solution may be to simply update the GLS to avoid the countdown being hit by the issue. Engineers have 30 minutes to evaluate instrumentation and report back on the forward plan, which may involve tests with the associated circuit breakers. After debating the situation, engineers have decided to leave the current GLS plan in place and continue to monitor during the countdown. The countdown resumed at 13:23 EST and count down to the T-9 minute mark. At that point (13:34 EST), the countdown entered its final built in hold. This hold, assuming a launch at the center of the window, will last for 45-minutes and 11-seconds. Approximately 15-minutes before the targeted T0 time, NASA Test Director Steve Payne and Shuttle Launch Director Mike Leinbach conducted the final “Go/No Go” for launch poll. If all consoles poll “go,” Atlantis’ countdown resumed at 14:19:11 EST. All went as planned, with Atlantis’ three Space Shuttle Main Engines conducting their staggered start sequence at 14:28:04.4 EST, with the Solid Rocket Boosters igniting at 14:28:11 EST to begin to the STS-129 mission. The lauch was extreemly clean, with no issues during ascent. Highlighting the resolve of the NASA workforce to understand any unexpected performance issues with the Shuttle fleet, engineers have reviewed the recent performance discrepancies with two Fuel Cells (one each on STS-127 and STS-128). On STS-128, Fuel Cell 2 (FC-2) experienced two operating anomalies, neither of which affected the mission performance of orbiter Discovery. Despite this downward trend, FC-2 never dropped below the Operations and Maintenance Requirements and Specifications (OMRS) limit of 55 psi before STS-128. The FRR presentation noted that this trend could be part of an overall trend in the H2/O2 regulator. A less likely possibility is that the drop in coolant pressure was the result of a coolant leak. Nevertheless, the problem could not be repeated during post-flight troubleshooting efforts. Moreover, since there is no evidence of this “trending” in any of the three Fuel Cells in Atlantis, and coolant ullage checks have verified that no leaks are present, this issue is not a concern for STS-129. However, this was not the only issue observed with FC-2 during STS-128. During the mission, the FC exhibited a “greater than normal condenser exit temperature and lower resultant KOH concentration,” notes the Orbiter Project FRR presentation for STS-129. In fact, FC-2 on Discovery was the second FC in as many missions to exhibit a high condenser exit temperature coupled with a low KOH concentration. One of Endeavour’s Fuel Cells (S/N 121) on STS-127 reached a condenser exit temperature of 161 degrees F and a KOH level of 28 percent. During Discovery’s mission, FC-2 reached a condenser exit temperature of 159 degrees F with a KOH concentration reading of 29 percent. Initial thoughts indicated that this issue may pertain to the use of the SSPTS (Station to Shuttle Power Transfer System) to alleviate the burden on the Fuel Cells in Discovery and Endeavour (the only two orbiters that have SSPTS capability) during docked operations with the International Space Station. However, this line of thought no longer appears to be correct. “All of the above problems appear to be independent of SSPTS operations,” notes the Orbiter Project Office FRR presentation. In all, SSPTS has flown on eight missions (four each on Discovery and Endeavour) with the FC issue manifesting only on the last two SSPTS flights. While a high condenser exit temperature and low KOH concentration holds the potential for Fuel Cell shutdown during flight, both Endeavour’s and Discovery’s affected Fuel Cells were in no danger of being shutdown. This was due in large part to the vigilance of ground controllers and pre-flight KOH measurements of the Fuel Cells that verified the KOH limits and the proper calibration of the KOH sensors. The KOH lower-level limit is 24 percent, with the in-flight rule being 29 percent to protect for potential instrumentation bias. Since the “average KOH concentration on both flights was 30 percent,” the missions were not in danger of losing a Fuel Cell to this issue. Nevertheless, investigations on these anomalies were conducted, with vendor review of the Thermal Control Valve histories of the affected Fuel Cells starting after the completion of STS-128. As such, testing has failed to identify any correlation between the SSPTS operation and the long-term health of the Fuel Cells. Further, all three Fuel Cells installed on Atlantis have passed diagnostics and/or ATP and all Fuel Cells with “out-of-family” condenser exit temperatures have been removed from the fleet. As such, STS-129 and subsequent flights have been cleared for flight from this issue.